> Bulk quantities of Uranium Ore for classroom experimentation, chemical Uranium extraction or mineral collectors. A great variety of Uranium ores from multiple mine locations in the United States. Radiation emission from individual ore samples varies considerably, but all samples are guaranteed to measure over 1,000 CPM. The vast majority of the ore samples are far hotter than that. 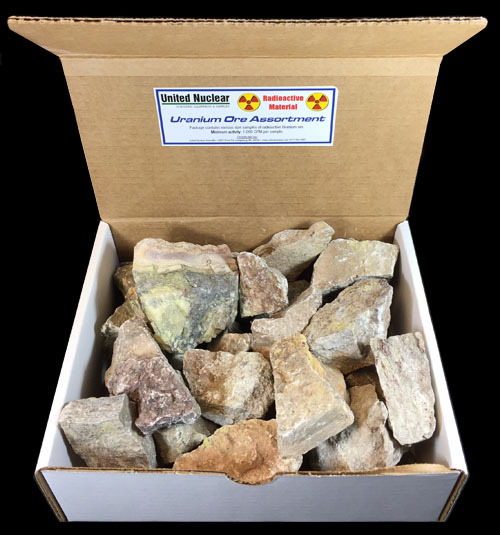 Each individual Uranium ore sample is tested for radioactivity and we guarantee that there are no 'dead rocks'. If you are using a 'pancake' (alpha/beta/gamma probe) for measurement, the radiation readings will be about 7 to 10 times higher. Assortments may contain primary and secondary Uranium ores including: Carnotite (bright yellow), Uraninite (black crystal), Pitchblende (jet black), Uranophane (canary yellow), Gummite (maroon to rust brown), and Tyuyamunite (green to yellow). Boxes are guaranteed to contain a minimum of 5 pounds (typically they contain much more than that). Buying this many ore samples individually would be about $500.